The Moor’s Pavane, José Limón’s dance meditation on Othello, was created in 1949 for the Limón company and has been cited by critics the world over as his masterpiece. As the historic barriers between modern dance and classical ballet have gradually given way, The Moor’s Pavane has been added to the repertories of ballet companies around the world, whose dancers have taken up the challenge of mastering a gravity-driven technique in essential ways so different from their own. As a distillation of Shakespeare’s great tragedy, The Moor’s Pavane is an ideal vehicle for that technique. 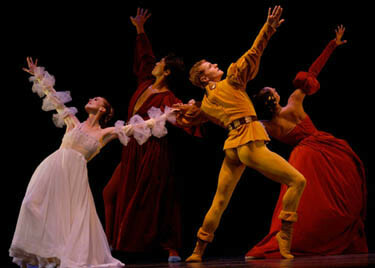 As critic Deborah Jowitt observed: “That…awareness of the pull of gravity made [Limón]—and his dances—look powerful: the struggle of muscles became a metaphor for the struggle of souls.” Here there are four, their individual natures and the emotional drama between them conveyed wholly through abstract movement: the noble Othello (called “The Moor”), the innocent Desdemona (called “The Moor’s Wife”), the treacherous Iago (called “His Friend”), and his sensuous spouse Emilia (called “The Friend’s Wife”), who unwittingly provides the evidence with which Iago goads Othello to tragedy. Within the stately measures of a Renaissance court dance, the pavane, set appropriately to music of Purcell, their various passions smolder, erupt, and move them towards the inevitable conclusion, ironically contrasting ceremoniousness and violence to the terrible final moment. Through his subjects and the distinctive technique that would embody them, Limón’s imagination was drawn to heroic figures and their conflicts. He wrote: “I try to compose works that are involved with man’s basic tragedy and the grandeur of his spirit. I want to dig beneath empty formalisms, displays of technical virtuosity, and the slick surface; to probe the human entity for the powerful, often crude, beauty of the gesture that speaks of man’s humanity.” The Moor’s Pavane won the Dance Magazine Award for outstanding creation in the field of American modern dance and has been in Pacific Northwest Ballet’s repertory since 1986.